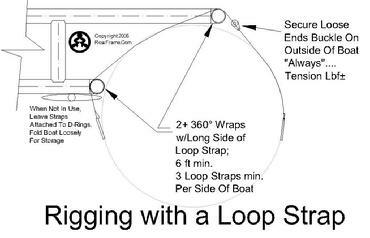 The recommended method of rigging is to use an 8 ft loop strap with a minimum of two wraps on the upper and lower longitudinal members. This prevents the tube from rotating and only requires one buckle properly located outside the craft. Never crawl inside a cat in moving water to de-rig. Eliptical Man doesn't do stairmasters. He acquired that phisique by rowing his cat down class fives in mid canyon Glenwood. His cat remained intact because he used quality USA made straps from StitchesNStufff91.com hereinafter referred to as Jan. 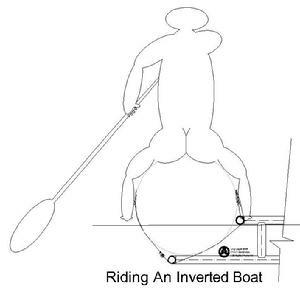 Yes the cataraft he's riding is upside down, a phenomenon that happens periodically when you get sideways. Rigging a cooler to be perfectly suspended inside a raft chassis is not a complicated affair. Rigging one to be bear proof takes a little forethought. I call your attention to the seat belt, the restraining appurtenance added to vehicles in the mid 60s courtesy of Sir Ralph Nader. These are sent to the furnace daily with no one seeking their recycle. You know where to get them, are dirt cheap, fully capable of taking 2000 lbs of thrust and are infinitely expandable. Turn their release button inwards and they become the nemesis of even the most intelligent of bears. You’ll need two complete belts with 72” feet of 2” nylon webbing, nylon thread, a thimble and 4 quantity 2.5” steel rings (the kind you make a bridle out of). You’ll also need a wife with a camera to document the experience on YouTube.